... 35% and / or for slopes of more than 5 meters in length and / or in areas with strong winds, it is advisable to design the roof equipped with ventilation and equipped with a micro-perforated waterproof membrane. Innovation at the forefront of design and functionality. Its exclusivity laying, alone or combined with Vienna tile, creates roofs plenty of colors and expression. The perfect flatness turns each piece into a work of art. The frontal furrow makes it personality and homogeneily to the roof. Tradicional elegance with a cutting-edge design. Our most requested tile due to its size, strength and lightness. ... special sintering process at approximately 1200°C. This lends the tile special resistance qualities against aggressive environmental influences. Requirement per m²: from 10 pieces standard roof slope: 25°. Saxony Country Slate is designed to complement the inherent beauty in French and Tudor architectural styles. Available in a broad range of colors, it faithfully captures the appearance of natural slate. 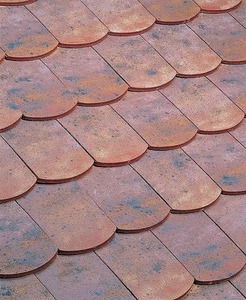 The flat roof tile is a roofing element made of terracotta or concrete. The visible end may be straight, rounded or trapezoidal. Some have a concave edge. Flat tiles are rectangular with an attachment nub at one end and holes for nails. Small sizes are from 16 x 24 centimeters to 17 x 27 cm, while large versions range from 15 x 30 cm to 20 x 38 cm. Most are made of terracotta or concrete. They are laid with a two-thirds overlap and staggered joints on laths. Tiles ends can be rounded, straight or trapezoidal, certain with a concave edge. Construction locale, style, roof pitch (from 70 to 200%) and support will determine choice of flat tile.